This is the second in a series of historic photographs of Boyle Heights purchased from Roger LeRoque, a local collectibles dealer whose family resided in the neighborhood in the early to mid 1900s. Today's image is a real photo postcard of what is described on inscriptions on the reverse as Klingenstein's, a store that sold candy, tobacco and had a soda fountain (as is obvious from the photo) and which was located near the intersection of Brooklyn (César Chávez) Avenue and Soto Street. Further notes on the card detail the types of products sold in the store, including vanilla and strawberry ice cream from the Los Angeles Creamery Company; Y-B cigars; Owl 5-cent cigars; Welch's grape juice; Carnation malted milk; Wrigley's chewing gum; Velvet smoking tobacco; Old Mill cigarettes; and, on the barrel on the counter at the right, Dr. Swett's root beer. 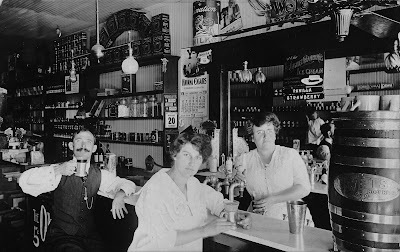 Presumably, the jaunty gent, with his striped vest and tie, and the two ladies with him at the counter were enjoying a soda from the tap, which the woman at the right has her hand on. This photo was taken on 20 August 1916 of a soda fountain and store said to have been near the intersection of Brooklyn (César Chávez) Avenue and Soto Street in Boyle Heights. Courtesy of the Workman and Temple Family Homestead Museum. Jars with candy, steel tins, and cardboard boxes of goods line the back shelves and counter top, including some viewed through the mirror at the shelving along the wall behind the photographer. Boxes of cigars are in a glass case behind the man, as well. Note the young person (a boy?) standing next to that shelving as seen through the mirror. Also of note is the two-light fixture hanging from the ceiling with one being a large, bare bulb and the other having a globular shade. Next to the mirror at the center and at the upper right are other fixtures. Next to the mirror are two calendars, one has the month and date of August 20, while the monthly to its right shows the year as 1916 (using magnification the year was also written on the card over the very white dress of the woman in the foreground). On this latter, however, is the name Klingenstein's, which was a cigar-distribution company in downtown. So, the identification of the store as being "Klingenstein's" may be incorrect, unless the owner of the company had the store as a side business, but that hardly takes away from the interest in this great image. Contribution by Paul R. Spitzzeri, Museum Director, Workman and Temple Family Homestead Museum, City of Industry, California.